Sentry is very professional, fair quotes and their crew does great wood-work repairs. I'm a Realtor with century 21 Everest and I was using another company until I called Sentry for a second opinion and estimate, they knew how to save my clients money and beat the other company I was using and the work turned out awesome ! Everyone at Sentry is courteous,timely in their response and gets the job done. Best company ever. Exceptional employees. Kind. Funny. Professional. Very happy with their service. Prompt and courteous with a one yr warranty! Hope we don’t need them again but would definitely use their services! The team at Sentry Termite are all great! I am a Real Estate Agent in Thousand Oaks, Simi Valley areas and Rick Urquidi always does a fantastic job making sure he is thorough on his inspections. I would highly recommend them to everyone! Cynthia Bailey ~ eXpRealty of California, Inc. I am very happy with the service I receive from your company. Your tech is always polite and explain to me all of his findings. This was the second time I have used Sentry for my termite inspection. I am refinancing my house, and needed an inspection done immediately. They sent someone out the same day I called. The technician Rick was awesome! He talked me through the inspection, and was great with my dogs! Thanks Rick! The technician was very professional and knowledgeable. He identified the issue quickly, and was able to address it the same day. I was impressed with his expertise and diligence. Excellent customer service, including a same day service appointment. I just started the service, but everything has been perfect so far. The service has been excellent , and very professional.I'm a Realtor and have worked with many Termite Companies the wood repair that was done for my clients was some of the best I have seen ! Thanks so much for your help and top rated service ! Great pest control company! Chris always calls prior to his arrival date, is on time and ensures gates are closed and secure before leaving. Haven't seen ants or spiders in years...would recommend to family and friends! you for sure. Thank you for your service. We will always use Sentry Termite and feel confident to referring them to family and friends! The team at Sentry Termite is very professional and reliable! Bill is awesome we love him. I am pleased with the work that was done on my house in Simi Valley to ready it for the real estate market. Thanksfor the great work. very professional, great communication, awesome results. we had Bill McElroy service us and i am beyond satisfied thank you and Bill is very knowledgeable and professional THANK YOU!!! fair, and thorough.....V. G. Simi Valley. I think Sentry in honest, thorough and works with professionalism!!! Honest, knowledge, and well priced! Sentry people are professional, precise and take care of business. They absolutely do what they commit to do and leave no mess or debris behind. They are also friendly, personable people who make it easy to communicate with. I would use them again in a heartbeat. You guys are the best. Have used you numerous times in my real estate transactions. You always respond quickly and professionally. You will always be the company I call. Thanks again for the great service. Excellent service. Bill spent an hour inspecting my home. He was very knowledgeable and thorough . I wouldHighly recommend them. Fantastic service.. Again. They are professional during every service including the tenting project we just did at a house. We use them exclusively for our personal home and business referrals to our clients. Thank you again !! This is our second service visit with your company and we are still satisfied with your service. The representative was professional, pleasant, thorough and took the time to answer questions. My only potential concern is that the representative that came out on the initial visit was a different person. I was told by the representative on the first visit that he was very familiar with the area, and would be the one servicing my home going forward. Should this be a concern? Hopefully not, as this was a problem with the last two companies that we used. I was sure I had termites (I googled it) and imagined the worst - the tent!! The technician “Rick” is knowledgeable, thorough and honest. I have crickets:). Great customer service from the friendly lady who took my call to the owner, John. I highly recommended Sentry! 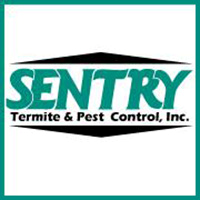 Sentry Termite is an amazing company to work with. Their entire staff is extremely professional, knowledgeable helpful and courteous! They always help us out with last minute scheduling and they go the extra mile! We recommend their services to everyone we know! I used John for years, would not think of going anywhere else. Great service! The text the day before is great in helping remind me to put my dogs in. Quick response, very professional, very satisfied with the work done. The "most courteous, clean, and efficient crew" ...this is a direct quote from YOUR last job..my tenant!! for your continued level of service ...V. G. Simi Valley. On time! Professional! Friendly! Informative! Tidy! We were very happy and would recommend Sentry in a heartbeat.